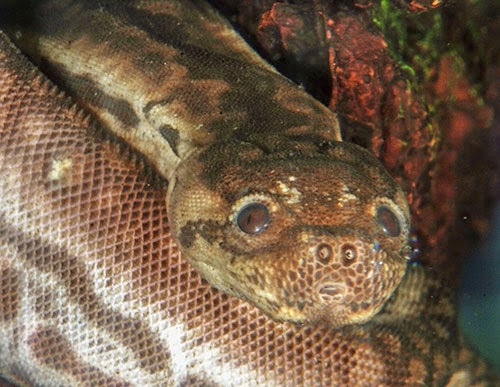 Potamophis javanica - Schmidt, 1852. There is some confusion on the type locality of A. javanicus. Shaw (1802:573) suggests the type specimen came from a “…large pepper-ground near Sangasan…” Java. Smith (1943: 132) simply reports the type locality as Java. Steubing (1991:329) reports the type locality as Bantam (also spelled Bantem), W. Java. And, McDiarmid et al. 1999:229 reports both of these literature accounts and makes no judgment as to the actual type locality. Distribution: the Indonesia Archipelago, Cambodia; Malaysia; Singapore; Thailand; Vietnam. Diagnosis: Snout blunt; nostrils pointing forwards; eyes on the upper surface of the head, pointing upward and out; crown with very small scales in 18 to 22 on a line between the eyes; a series of small upper labials and lower labials 25 to 30 in number; 130-150 scale rows around mid-body; dorsal scales juxtaposed, trifid with the median spine the longest; no fold of skin on mid-ventral line (as in granulatus); scales on mid-ventral line are narrow and have longer spines that adjacent ventral scales. Young usually spotted dorsally; brown or olive brown above, paler below, flans with rounded or elongated spots. [Based upon Smith, 1943]. Acrochordus javanicus is harvested in large numbers in wetland areas with intensive fishing. The following is from Nijman et al. (2012, Herpetological Journal 22:83-89). Since at least 1999, the A. javanicus annual quota for all of Indonesia has been 200,000 individuals; 180,000 for skin export, 19,100 domestic use and 900 for pet export. In 2005, the quotas for Kalimantan and Sumatra were 80,000 and 20,000 individuals, respectively. Traders in Samarinda (East Kalimantan) source filesnakes from the nearby Mahakam Lakes (Jempang, Melintang and Semayang). Traders in Banjarmasin obtain filesnakes mostly from the Katingan area in Central Kalimantan, but also from the Sungai Negara wetlands in South Kalimantan. At least 80% of the Kalimantan harvest occurs in the wet season, when the main fishing areas are accessible by boat, and (according to collectors) the snakes are most active. Of the filesnakes exported from North Sumatra (Medan), 60% are imported from South and East Kalimantan and 40% are sourced both from throughout Sumatra (Medan area, Jambi, Lampung and Palembang area). Filesnakes exported from South Sumatra (Palembang) are harvested more locally (from south Sumatra, Bangka and Lampung) and mainly in the dry season. Filesnakes are mainly collected as by-catch in bamboo fish-traps (bubus) and fishing nets, although collectors in Sumatra also report catching filesnakes by electric fishing (Medan area) and baited fishing lines (Palembang area). Most of the harvest is apparently opportunistic; however an exporter in Banjarmasin reported that fishermen will directly target filesnakes when the demand for skins is high, and this dealer gives collectors advance payments to harvest A. javanicus. 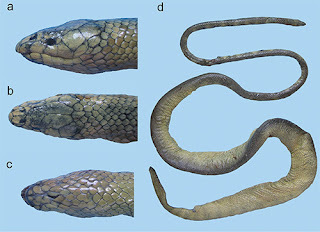 Filesnakes are generally exchanged alive from collectors to one or more middlemen, before reaching the exporters’ warehouse where they are skinned (Fig. 3). None of the traders surveyed specialized in A. javanicus harvest - most collected a large range of reptiles and amphibians for various trade purposes. The minimum size accepted in the skinnery in Palembang was 1.2 metres neck to vent length; only one other dealer imposed a size.